You will have breakfast early and then go for briefing before 8 am as by that you will be starting Chimpanzee tracking in Kaniyo Pabidi Forest which is an untouched piece of natural forest situated just within Budongo Forest Reserve and so you will be walking where under mature mahogany wood trees. The main tourist activity is the Chimpanzee tracking but also bird lovers can have the best experience as there is various forest bird species in that forest like the chocolates-backed Kingfisher, the chocolates-backed Kingfisher as well as the puvel’s illadopsis and these are hardly found any where else in East Africa but there will also be so many other primates like monkeys/ Red -Colobus, Blues, Red-tailed and grey cheeked Mangabey, among so many others. You will be out of the forest to have lunch and then later you will visit the top of the fall to have that best view of the falls as the water forces its way through the tight rocks to form fountain before flowing down the Nile. You will get a cup of coffee to warm up your body and then be transferred to the northern part of Murchison falls National Park for a game drive. Your guide will help you with all the necessary explanations you may need about the different animals you may meet like the Giraffes, Elephants, Buffaloes, Bush bucks, Lions, and a variety of bird species. At mid morning you will go back to the lodge for your full breakfast and then later in the afternoon have your lunch and afterwards go for launch cruise which will take you to the bottom of the falls of the Murchison falls. During the cruise you will have the opportunity to see a lot of hippos, crocodiles, water birds along the river banks and this makes the place good for a birding safari too. Overnight and dinner will back at your lodge. You will have to take breakfast very early in the morning and then go to Kanyankyu tourists centre for registration as well as briefing from the park guides just before you enter the forest for Chimpanzee tracking. This is the most popular walk among all Kibale walks which takes about 2-3 hours but this time depends on where these Chimpanzees will find the food. There will also be other primates like the Black and white Colobus Monkeys, other living creature which are also very interesting to watch as they wrangle and play. Later on you will go back to the lodge you’re your lunch and then in the after noon, you will go for Bigodi swamp walk where you will find a number of bird species. Later in the evening, you will go have dinner and overnight at your lodge. Day 7: Transfer to Semliki wildlife reserve. After breakfast and you will drive to Semliki Wildlife Reserve for one great scenic drive which takes you down the eastern side of Lake Albert since Semliki reserve is in the basin of the Western Rift Valley and is among the most diverse habitats in Africa with magnificent and variety of borassus palm forest, Riparian forest, gallery rain forest as well as the short and high grass savannas. Semliki is said to be one of Africa’s most bio- diverse forest and it is also famous for the different bird species in high population as well as the fact that it also one of Africa’s most ancient Forests popular because of having survived the dry conditions so many years ago together with Bwindi when so many other forests shrank thus the reason why it managed to protect some species that like the arid apocalypse until they eventually managed to emerge to re colonize a better wetter parts of the country. You will go have lunch at the lodge and then rest a bit. After having your dinner, you will go for a night game drive to search for the nocturnal animals. Night game drives are only be done in Semliki and you will be able to see the animals that hide during day time like the big cats, the very small Genet as well as serval cats, there may be white tailed mongoose and slender mongoose, standard and pennant winged night jars , among others. After this, you will go back to your lodge which may be. Immediately after having your breakfast, you will then go for chimpanzee trekking in the gorgeous rainforest and this should be done very early as they tend to disappear in the middle of the day. Besides the chimpanzees, you will be amazed by the number of bird species which are found in that forest. Later on, go back to the lodge to have lunch and then relax by the pool and enjoy the tranquility of the Lodge and then during the late afternoon hours, you will go for a game drive, you will watch the African sun dip below the horizon before you return to the lodge for dinner. 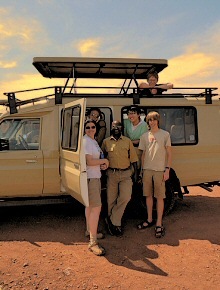 Day 9: Transfer to Queen Elizabeth national park. Day 10: Chimpanzee trekking in Queen Elizabeth national park. After a cup of coffee in the morning, the drive will take you for briefing that you are required to attend before the 08.00am chimpanzee trekking in Kyambura Gorge. You will have a ranger to guide you and you ca expect to see various primates most especially Chimpanzee, Black and white Colobus monkeys primates like the rd colobus monkeys, blue Mangabeys, black and white colobus monkeys among others. You will find very many bird species in this gorge too. You will be through trekking by midday and will go back to the lodge for lunch. You will be served with a cup of coffee and go for an early morning game drive in this park to search for animals like the Lions, Cape Buffaloes, Giant Forest Hogs, Leopards, Elephants, Defassa Water bucks, Uganda Kobs, Topi and Bush bucks among others. By mid morning, you will be back to the lodge to have your full break fast, rest a bit after and lunch will be ready in the afternoon. Later in the afternoon, you will go for 2-hour boat cruise along the Kazinga Channel that connects Lake Edward and George, you will see thousands of Hippos, crocodiles, water birds and many other animals along the banks during this boat ride. You can take as many pictures as you wish to take, bird watching and game watching will be very interesting. After this, you will head back to the lodge for your dinner and sleep. Day 12: Transfer to Bwindi National park. Standard; Buhoma Lodge / Silver back lodge / Gorilla Resort Camp/ / Gorilla Safari Lodge. Immediately after breakfast, cross the border then you will be driven to Musanze which is also called Ruhengeri and the pedestal of Gorilla Trekking in Rwanda. Within Musanze, there are attractions like the Volcanoes National Park, Virunga Mountains with their four peaks- Bisoke, Muhabura, Sabyinyo and Karisimbi which is the highest peak and can take you 2 days to climb but can climb Bisoke can be done in one day. 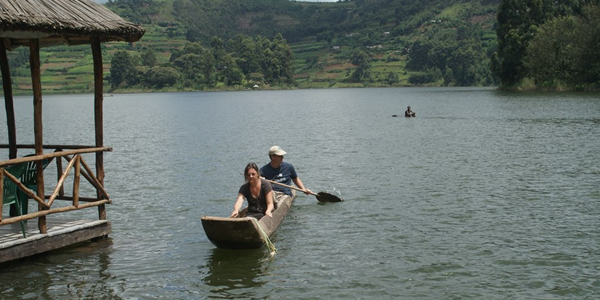 Other attractions include; the natural bridge, lakes Burera and Ruhondo. Dinner and over night at; Virunga lodge. After your breakfast, you will go for a guided nature walk during which you will see different animals, birds, butterflies and so many other wild features on the main land surrounding Lake Bunyonyi. At the end of it, what you will see will be worth the time will have spent and then go back to the lodge for lunch. After your lunch, you will do for a canoe ride on Lake Bunyonyi and this is the perfect opportunity you will have to see these different island in this lake which are home to variety of birds, birds will also be seen in the small swampy areas in the lake, there is the punishment island where girls that got pregnant before getting married where thrown in the ancient days and left there to die. After the boat ride, you will return to your lodge for dinner and an over night. You will go for the morning game drive in search for animals and birds, you will find lots of zebras, impalas, bush bucks, water bucks and over 310 bird species in Lake Mburo National Park. It is probably the best place in Uganda from where you can see Acacia associated birds and also of special interest to birders, are the swamps. The swamps are home to the highly localized Papyrus Yellow Warbler recorded nowhere else in Uganda. You will later go have lunch, have a some time to rest a bit and then in the evening, you will take a guided nature walk to the salt lick area where most animals in the park go to lick salt and is one place you can find different animals together. Dinner and overnight will be back at your lodge. Budget ; Central Inn Hotel/ Lake Victoria Hotel/ J residence hotel.